Unless this is the first post you’re reading on Health Tastes Good, you know I’m in love with sugar. 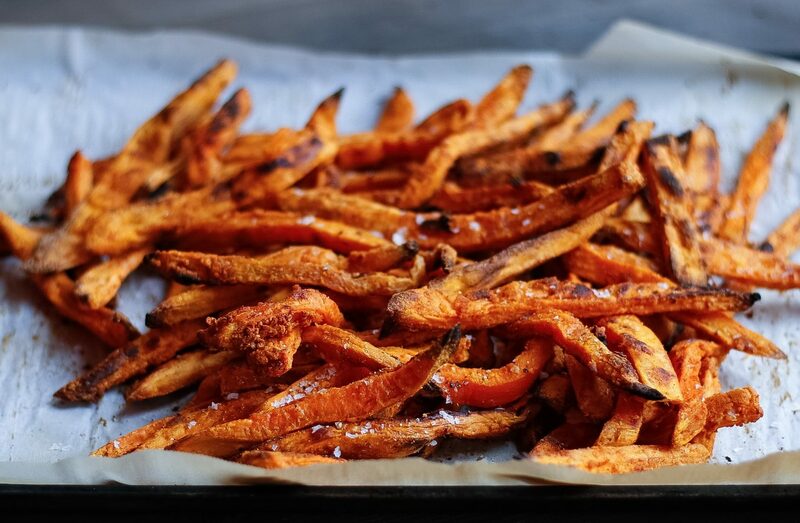 Sweet > Savory any and every day in my book- except when it comes to Crispy Sweet Potato Fries. This is the one food that if you put it in front of me next to a plate of chocolate chip cookies, I’d actually be torn by what to choose. I mean, have you every tried to eat just one? Yea, not possible. Can you see how crusty and crunchy they are? These beauties are baked, not fried, so go ahead, have a second handful. #TreatYoSelf. My favorite sweet potato fries ever are at Trapeze in Athens, Georgia. Not just the fries, but they come with Garlic Aioli + Raspberry Ketchup and both are to die for. Since Trapeze’s fries are actually fried, I’ll never be able to replicate them exactly, but I love being able to eat these whenever I want without derailing my diet since they’re grease-free and nutritious. As if these fries aren’t delicious enough on their own, dipping them in Raspberry Ketchup and Garlic Aioli make them irresistible. (I actually prefer to mix the two sauces together in one bite– mmm mmm mmm…but don’t just take my word for it!) 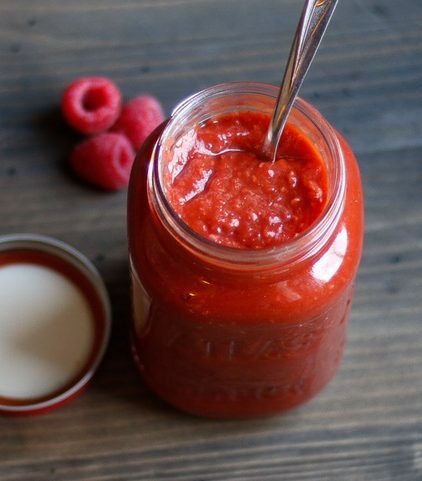 The recipe for both sauces is below, and although I make my Raspberry Ketchup entirely from scratch, you could attempt just blending the raspberry puree part with your bottled ketchup of choice, granted, I have not tried this yet. Start by peeling the potatoes, then cutting them into 1/4 inch match sticks. No, they don’t have to be perfect, just do your best to get the potatoes equal size so they cook evenly. 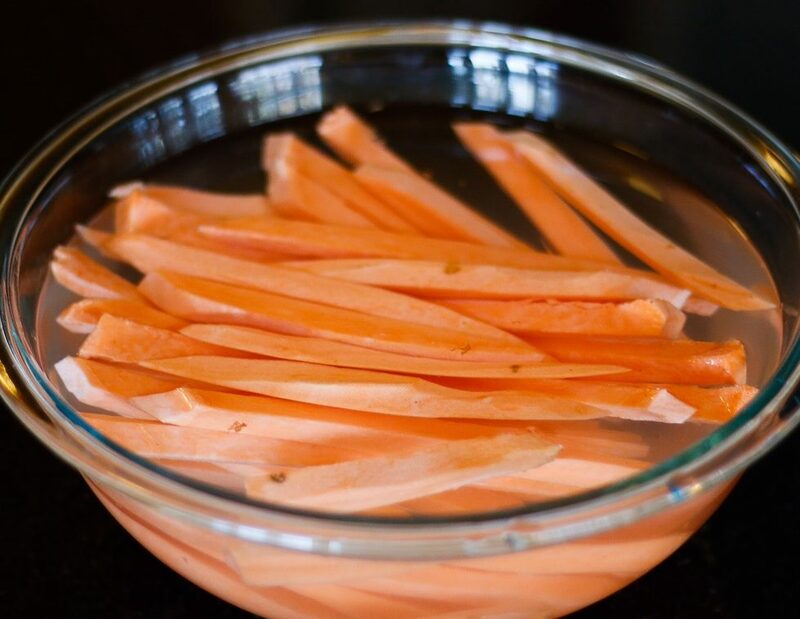 Step Two: (optional,but recommended) Place the sliced sweet potatoes in a bowl of cold water for at least an hour, but up to 24. This helps release the starch from the fries, and makes them crispier. 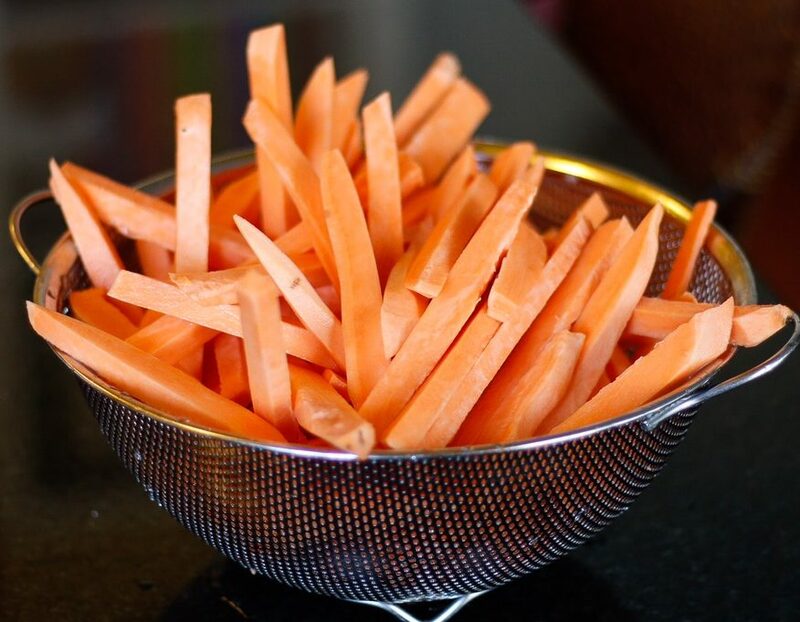 If you don’t have time for this step- trust me, I often skip it too- your fries with taste just as delicious, they will just be slightly less crunchy. Step Three: Drain the sweet potatoes and pat them dry. Then add them to a large Ziploc bag, shake with the starch, spices (EXCEPT the salt!) and oil until evenly coated. Step Four: Spread the fries out in an even layer on a parchment lined baking sheet. Here is the most important part- DO NOT CROWD THE PAN! I repeat: DO NOT CROWD THE PAN! (Yes, I’m actually yelling now.) If you only listen to one suggestion I make, let it be this- DO NOT CROWD THE PAN! Otherwise, they will steam instead of getting crisp. Finally, bake the fries at 425F for 15 minutes, flip them over, then bake another 10-15 minutes. After the baking time, turn the oven off, crack the door, and let the fries sit for another 10-15 minutes as they get even crispier. 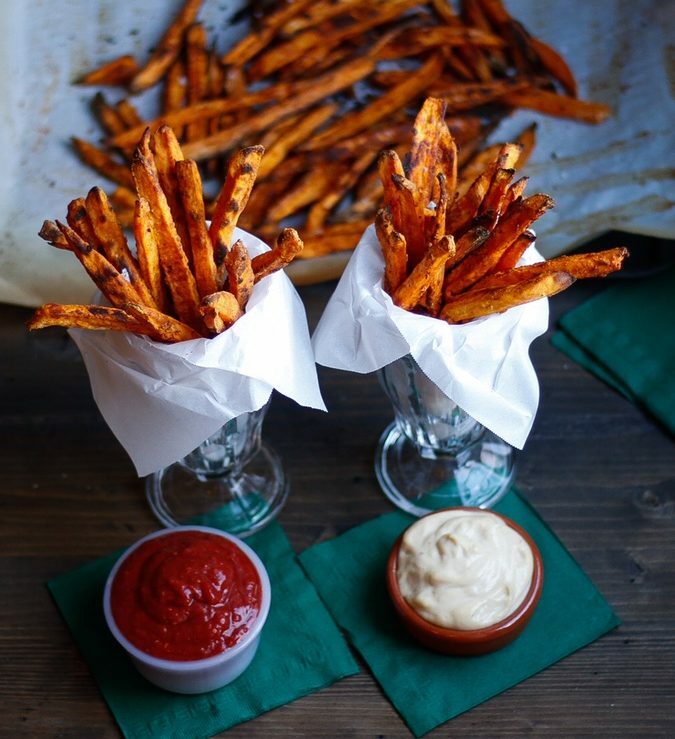 Just how good are these Crispy Sweet Potato Fries? Well, the first two times I made them, I ate the entire batch in a day (with a little help from my mom). Yes, that’s at least 2 entire potatoes. It’s safe to say I fulfilled my beta-carotene needs for awhile. 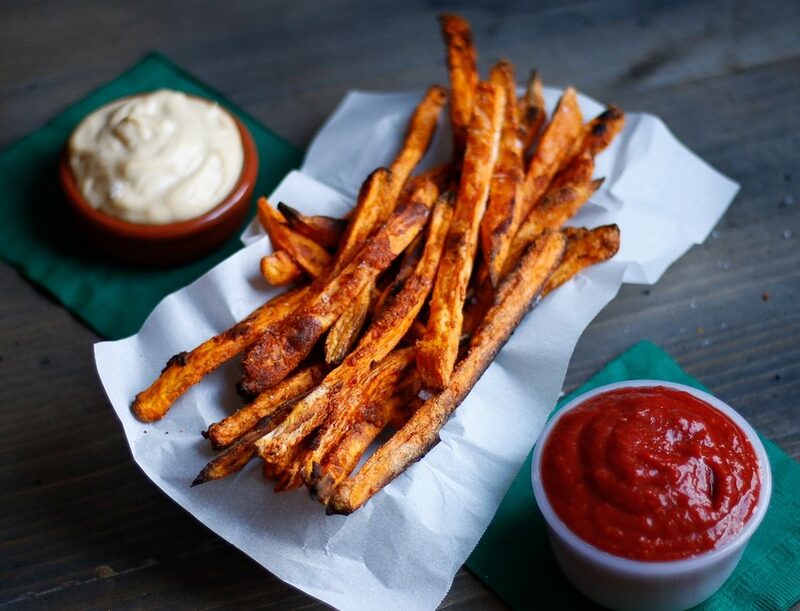 Crispy Sweet Potato Fries are the perfect nutritious appetizer to serve no matter what type of party you’re having. They’re easy to prep in advance, and can just be popped in the oven when you’re ready to eat. I hope you them as much as I do! 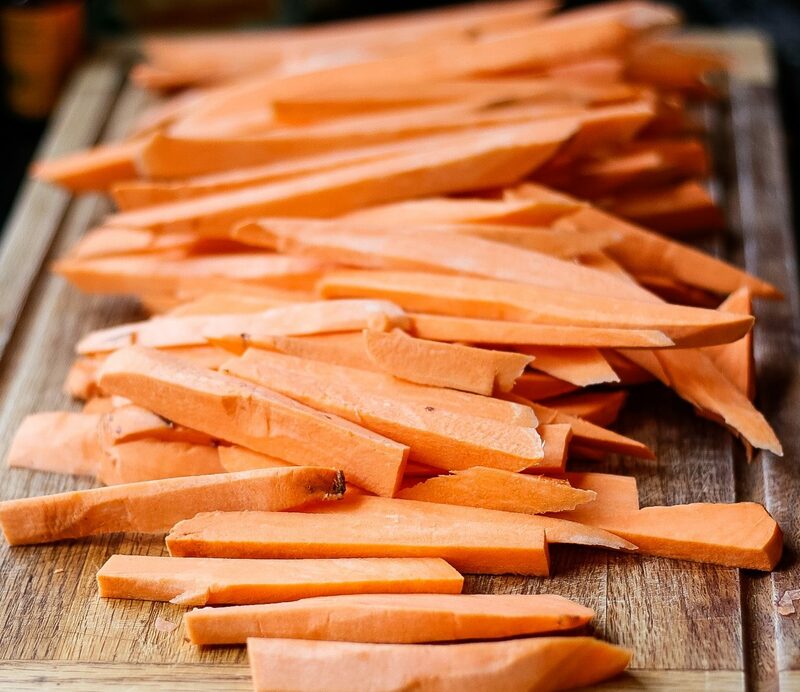 Place the sliced sweet potatoes in a bowl of cold water for at least an hour, but up to 24. This is optional, but helps release the starch from the fries, and make them crispier. 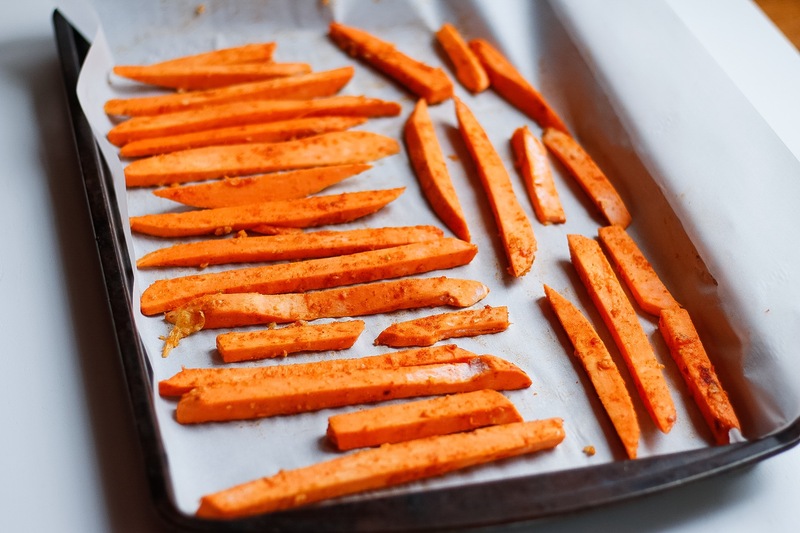 If you don’t have time for this step- trust me, I often skip it too- your fries with taste just as delicious, they will just be slightly less crunchy. Drain the sweet potatoes and pat them dry. Then add them to a large Ziploc bag, add the starch and shake until evenly coated. Then add the garlic, paprika, pepper, and oil, shaking again until distributed. Note: Do NOT salt until after they are baked! 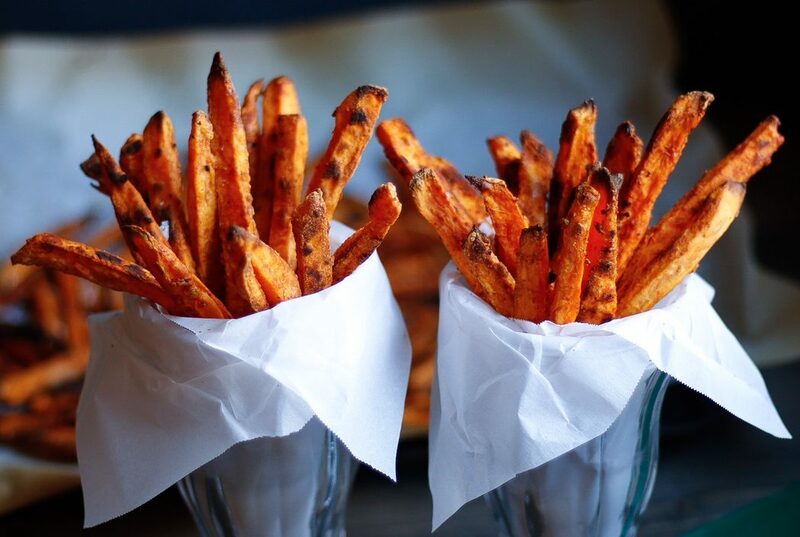 Salt will make the fries wilt while baking. 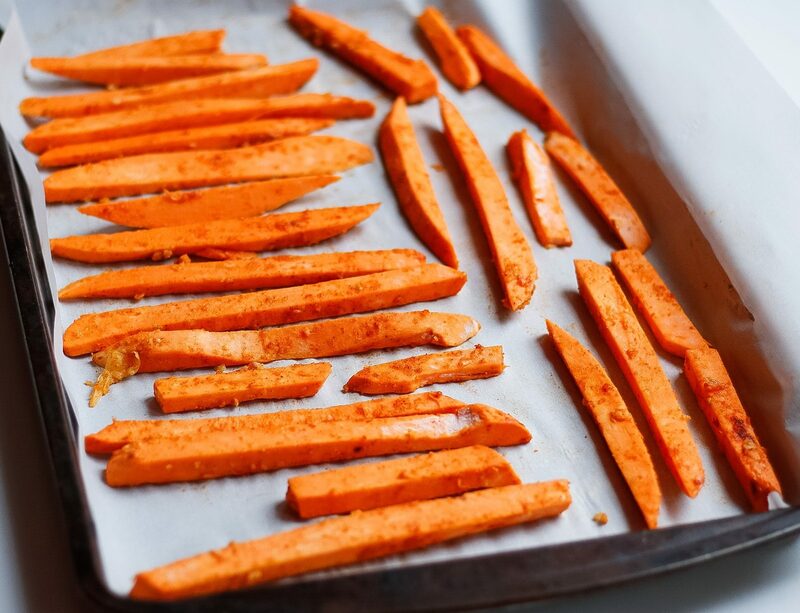 Spread the fries out in an even layer on a parchment lined baking sheet. And here is the most important part- DO NOT CROWD THE PAN! I repeat: DO NOT CROWD THE PAN! Yes, I’m actually yelling now. If you only listen to one suggestion I make, let it be this- DO NOT CROWD THE PAN! Otherwise, they will steam instead of getting crisp. Bake at 425F for 15 minutes. Flip the fries on each sheet, rotate the sheets in the oven (front part of the pan now goes to the back of the oven, in addition to switching racks if you have them on the top and bottom). Bake another 10-15 minutes, turn the oven off, crack the door, and let the fries sit for another 10-15 minutes as they get even crispier. Liberally salt the fries, and serve warm with Raspberry Ketchup and Garlic Aioli. 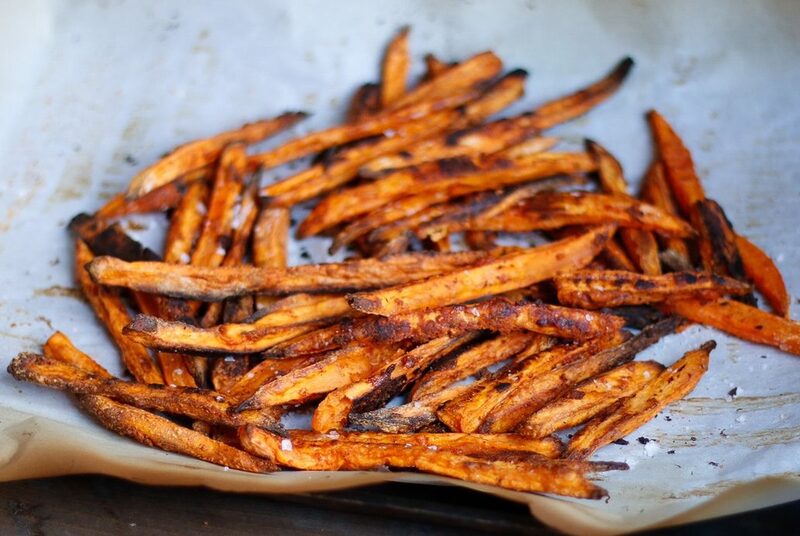 To Reheat: Place fries on a baking sheet in the oven at 400F, heating until warm. Microwaving the fries will make them soggy! Heat olive oil in a sauce pot, then add the onions and saute until starting to turn golden, 8-10 minutes. Add the garlic, stir until fragrant. Add the tomato paste, tomatoes, stevia, vinegar, and spices. Stir to combine, then bring the mixture to a boil, then reduce heat to low and simmer 45-60 minutes, stirring frequently so it doesn’t stick to the pan. While the ketchup is simmering, in a small sauce pan add the stir together raspberries and honey, and cook over medium until the fruit wilts down. Reduce heat to low, and allow to simmer until it is nearly a pourable consistency. Once the ketchup thickens, use an immersion blender or transfer to a regular blend and puree until smooth. Stir in the raspberry sauce to the ketchup. If you’d like, puree the ketchup to make it entirely smooth, although I like to leave it with just a bit of texture. Also, adjust salt and sweetness if needed, adding 1-2T tablespoons of additional honey, 1/2 T at a time. Preheat the oven to 400F. Slice the top stems off the entire head of garlic off (so some of the bulb is exposed) and wrap in foil. Bake 45-60 minutes, until very soft. Scoop out the softened flesh, discarding the skins. Measure out about 1/4 cup (more or less to taste) and blend in a food processor with the remaining ingredients. Store in the refrigerator. *Arrowroot is a natural form of cornstarch that I almost always have on hand. If you can’t find this, corn starch or tapioca starch will work just fine. **I used coconut oil because it’s a better “high” heat oil. However, I’ve made these with olive oil before and they’re equally delicious, I just know it’s not good to roast with olive oil. Avocado oil would be another good high heat option.